Starring leprechauns, pots of gold and chasing rainbows. This video slot definitely tickles your fantasy. 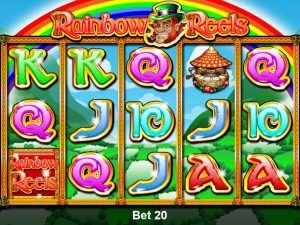 The rainbow reels slot has a layout with 5 reels and 20 paylines with a background of dreamy hills. 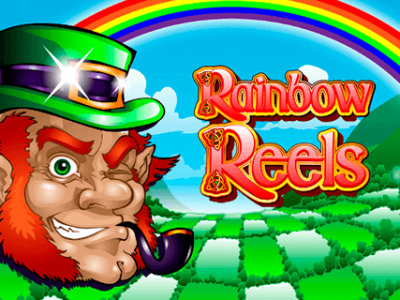 Rainbow reels is a slot by Novomatic, a longtime player in online gaming. Well-known for its excellent themes, they’ve got a long list of successful online slots behind their name. Novomatic was born in the 80’s and since has become a company with a great reputation of trustworthiness. They specialize in developing high-tech games for casinos but also have a lot of online games. A little traditional, a little modern. The symbols on rainbow reels are a mix of both. Familiar symbols like 9, 10, J, Q, K and A are nicely executed in Irish style to fit the theme. You win when 3 or more the same symbols land on the reels. The Leprechaun is Wild, so that can be your life saver if you only have 2 desired symbols on the reels. Winning line! The rainbow symbol is the most lucrative of all, paying out 500 coins if you get 5 on a line. The rainbow reels jackpot is 500. Thanks to the many bonus games, it’s being made easy to win big. Your prizes can be multiplied for example with the Gamble game. You’ll find the colours red and black flashing on your screen doubling your prize. You can choose to double it again… and again. If you dare. The Gamble game is an excellent way to make extra cash. In order to start the bonus games, it’s required you get 3 of the picture symbols. A spin starts from 1 coin to a max of 500, so there is a wide range for you to choose your bets from. Happy spinning!